I'm working on a pro-bono project to improve the user experience on Public Lab's site. 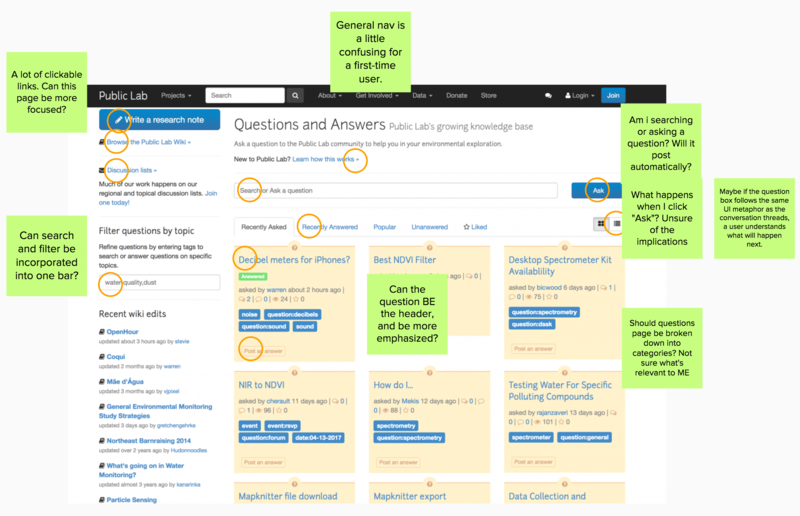 I've spent some time in the past few weeks learning about and evaluating the Questions page for ways to improve the UX/UI. 1. Assuming that a user's goal on this page is to (1) ask a question, (2) answer a question, or (3) explore the discussions, how does the page facilitate (or slow down) these goals? 2. Can the page be reframed to give askers more agency over the discussion? 3. 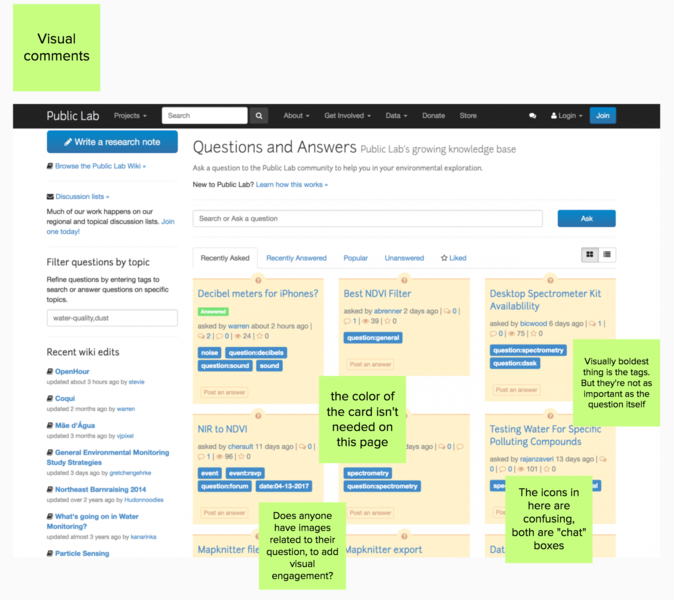 On what other pages are the questions relevant, and in what context should they be embedded? I also checked out design patterns on analogous sites. 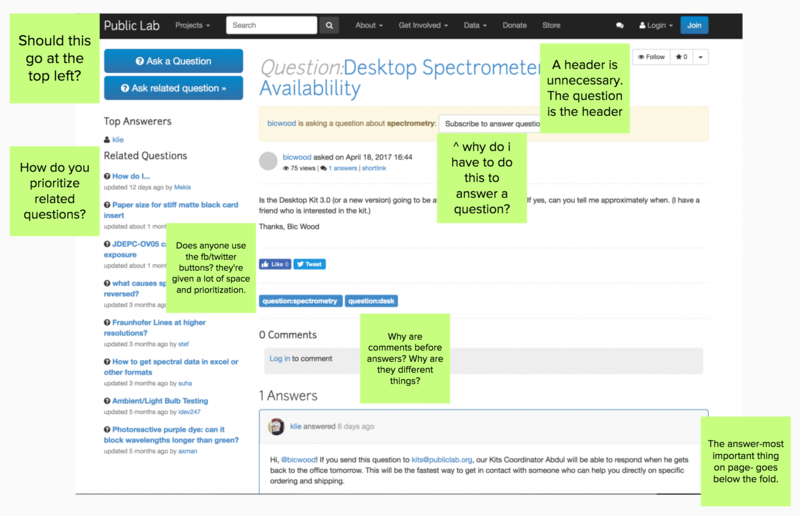 I looked at Stack Overflow, Quora, Slack (asynchronous chat), Reddit (threading), and Instructables for common, intuitive experiences in discussion-based domains. In the next couple of weeks, I'll be ideating and sketching some ideas for features/layouts that will address some of these comments. Just wanted to say, I love this analysis and have shared it already with @stevie and @liz and @becki -- thanks so much for posting it here! We're very much looking forward to the next steps, so please tell us what you need. Thanks to you and to Autodesk! Thank you for this, it's really relevant, thanks for the targeted look! Just linking in our #soc Summer of Code team who may be interested to read over these analyses as they develop various new interfaces! hi @siyuan , I'm excited to help you get whatever other information you need to ideate and sketch some ideas for features/layouts.